Pelican Eyes Resort Living has been reinvented... We are now a Gated Community...Pelican Eyes Resort Living at Casa de Cooper. 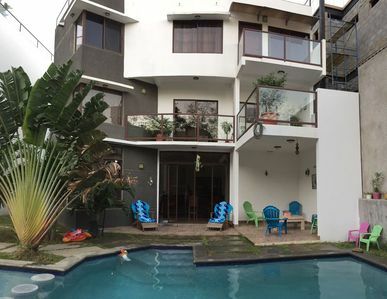 Casa de Cooper is a privately owned Villa still renting inside of the Pelican Eyes' gated community with all the three resort living pools in operation plus your private pool. 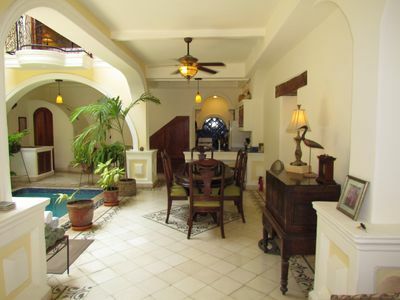 Private Pool, large Master Bedroom with twin showers, 2 Bedrooms and a View of Paradise from inside your private patio. 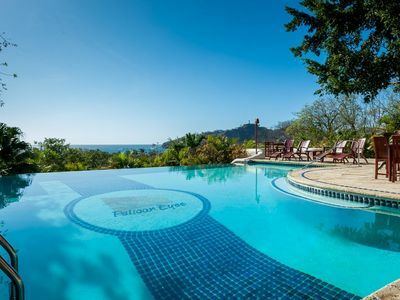 All of this you from this luxurious two bedroom sprawling Villa with private pool that overlooks the Pacific Ocean and the sleepy fishing town of San Juan del Sur. 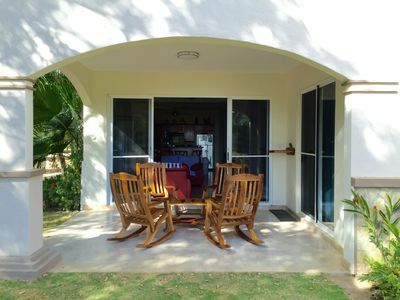 Vista Paraiso is a privately owned and operated two bedroom Villa in Pelican Eyes that can comfortably accommodate between 2 - 8 guests. 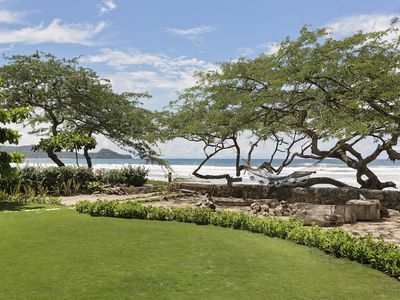 This is an ideal home for a luxurious honeymoon or for families or friends looking to host a tropical reunion. 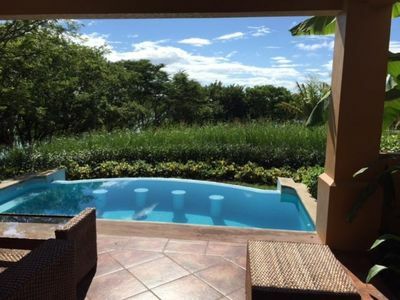 Vista Paraiso is also a perfect home if you are looking to entertain business clients visiting Nicaragua due to the very private arrangement of the sleeping quarters. 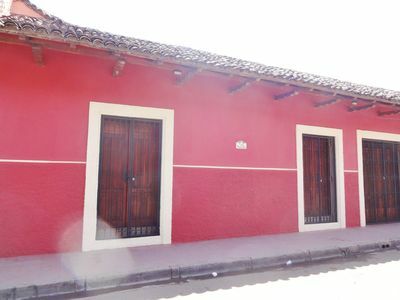 The lower entry level of the home contains two comfortable and private bedrooms. The master suite - lovingly referred to as the Winchester Suite is a spacious master suite with a private entrance, king bed, private shaded patio exclusive to the room, ensuite shower with a double hot water shower, double vanity with stone bowl sinks from local artisans and plenty of storage and hanging space for your items and Wingback chairs for a quiet and private space to relax from. The Winchester suite also benefits from a private TV/media area with a large flat screen TV and wing chairs. Bathrobes are included. In keeping with the master bedroom, the second bedroom has a bar fridge a small food prep space to prepare snacks, coffee and keep cold beverages right at hand. The bedroom has two comfortable and well-appointed queen beds. In keeping with the master suite this room benefits from its own shaded ocean view patio space for your enjoyment. 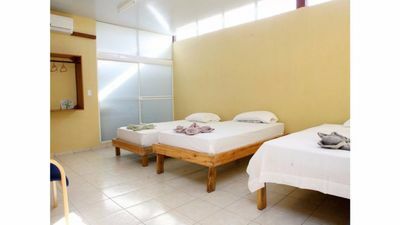 Similarly, this room contains a large flat screen TV, private and spacious ensuite with a large hot water shower, double vanity with hand painted sinks from local artisans and plenty of storage and hanging space for your items. Each of these two bedrooms provides your group with own hideaways within the Villa allowing for as much or as little interaction as you desire at any given time. Just steps from your bedroom you can start or end your day with a refreshing dip in the calm waters of your private plunge pool with views across the Palermo Valley. Ready to cool off? Start or end your day by stepping outside your front door and stepping into your private plunge pool overlooking the Palermo Valley. Spend the day lounging on the deck chairs swinging in the hammock napping or reading a good book - At night grill up the days catch of mahi-mahi shrimp red snapper or some of Nicaragua’s famous beef on your own north American style BBQ. 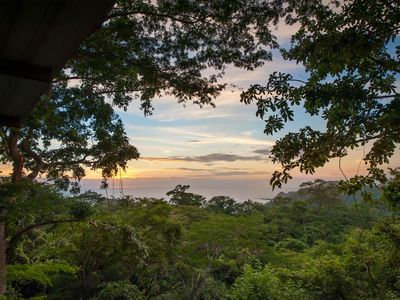 The upper level of Vista Paraiso contains the fully stocked kitchen complete with every pot pan glass and utensil you might require to create a gourmet meal using fresh local Nicaraguan ingredients - a large gas range and oven will please any chef in your group. Indoor eating space is also provided for the evenings you would prefer to sit inside. The attached comfortable lounge space includes a flat screen television cable TV and seating for eight and the large couch space can be converted into a queen size bed to accommodate 1 - 2 more guests - perfect for small children or third member of your party. An additional bathroom is located on the upper level of Vista Paraiso for easy access from the kitchen and futon sleeping area. An additional seating area extends off the shared space with views of the town below the deep blue of Pacific ocean and the sprawling ranch land to the north. 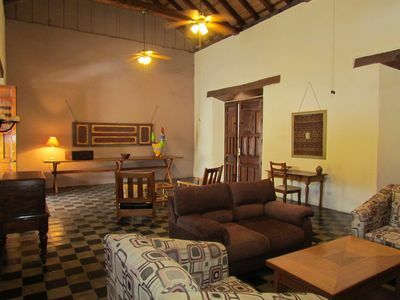 Built from the material adobe Vista Paraiso is a fresh and comfortable space even during the heat of midday. 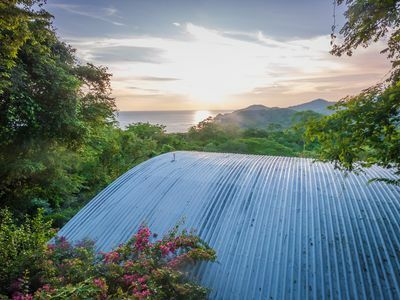 Elevated above the town of San Juan del Sur, the casa benefits from nearly constant cooling breezes. Containing all the modern amenities one might require. 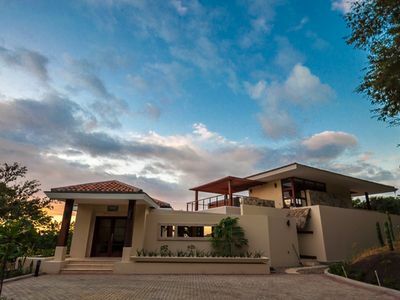 Vista Paraiso 2 bedroom villa offers you A/C, WIFI, hot water, cable, backup generator for SJDS frequent power outages, 24-hour security, daily maid service, and onsite maintenance team. 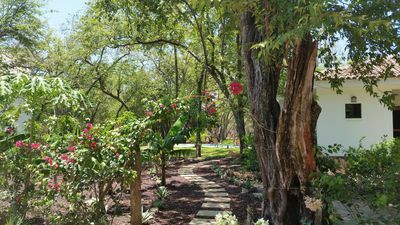 Everything is right at the fingertips that you will need or want for a comfortable and relaxing vacation. 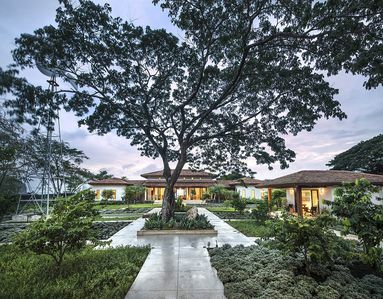 Vista Paraiso is accessible by foot for anyone with a good level of fitness. 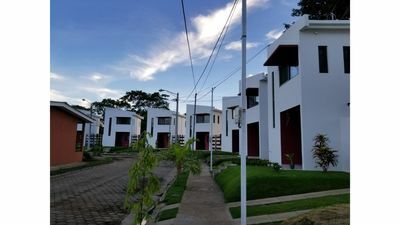 The home can also easily be accessed via a short cab ride to or from town making the home ideal for all ages of guests without mobility issues. 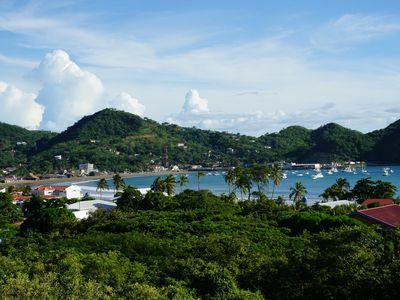 This location allows you to explore the many fun and exciting restaurants shops and bars located within the town of San Juan del Sur. Car rentals and ATVs can easily be arranged at discounted rates for those looking to explore the surrounding area further - a must do for the adventurer in your group! A private parking spot is provided for your use. 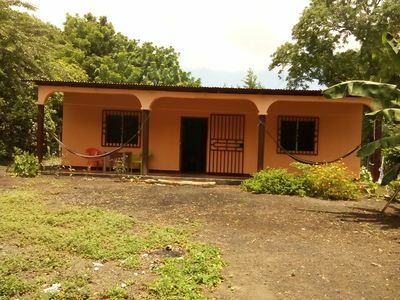 The home is also conveniently located inside of the popular resort of Pelican Eyes - placing a restaurant and bar within easy walking access of the house. You need not to go far for a delicious meal or sunset cocktail. 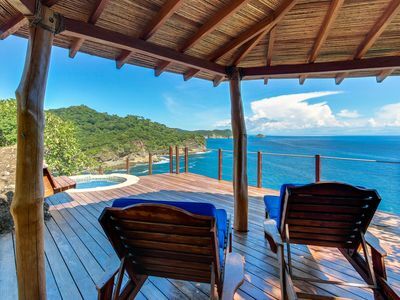 Vista Paraiso contains all that you need to have a restful relaxing and of course a romantic vacation. 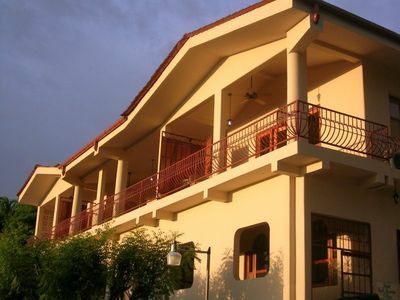 The owners Sandra and George take great pride in providing you the guests with a well stocked and well-appointed home. Guests of Vista Paraiso as a whole also benefit from the expertise of a professional bilingual meet and greet team who will assist you the guest with every aspect of your stay from the initial rental the planning prior to your arrival your arrival in town and be available to help with planning activities here in San Juan del Sur"
We now give you a better rental by giving you 30 kWh of electric use per day. If you use over that mattered amount, we charge a small U$0.52 per kWh. This conserves the energy for Nicaragua. 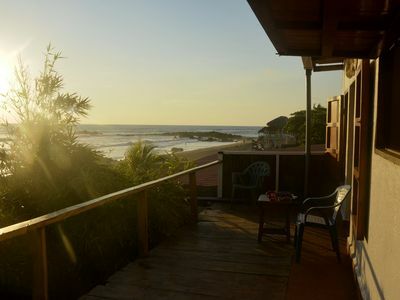 Enjoy the beaches and the joy of San Jaun del Sur.